In the investment world, two of the most confused words are merger and acquisition. The two terms are usually used in place of each other regardless of how varied they are from each other. For individuals who might be interested in business and management as a course or career path, the differences might come naturally when they decide to explore the topics fully. The two terms are applied in reference to the joining or linking of two companies. They are common words in business news on radio and TV but few people know they are different all the same. While a merger refers to a situation where two separate ventures, entities, business, or companies combine forces to form a new joint, an acquisition refers to a takeover of one of the entities by the other. If you are interested in exploring deeper differences between them, read through for great insights. A merger is defined as the process by which two or more entities, companies, or business ventures come together and join forces to work on a common strategy. The strategic decision they make is aimed at realizing better approaches towards a common goal in relation to a common product or service they all offer. Companies sharing invaluable skills, resources, information, and technology to increase the overall strengths of the companies involved. Helping to reduce weaknesses as well as gaining a competitive edge in the market. Before a merger happens, the participating parties are required to notify in writing all the necessary authorities. They are also required to submit various documents including their sales and purchase agreements, latest annual reports, board resolutions and relevant documents related to the merger decision, audited financial statements, and a breakdown of employees. The laws vary from region to region and country to country. An acquisition is the process by which a company acquires another and the latter ceases to exist altogether. The company doing the acquisition acquires more than 50 percent of shares for the acquisition to happen. Unlike a merger, an acquisition does not happen on friendly terms. 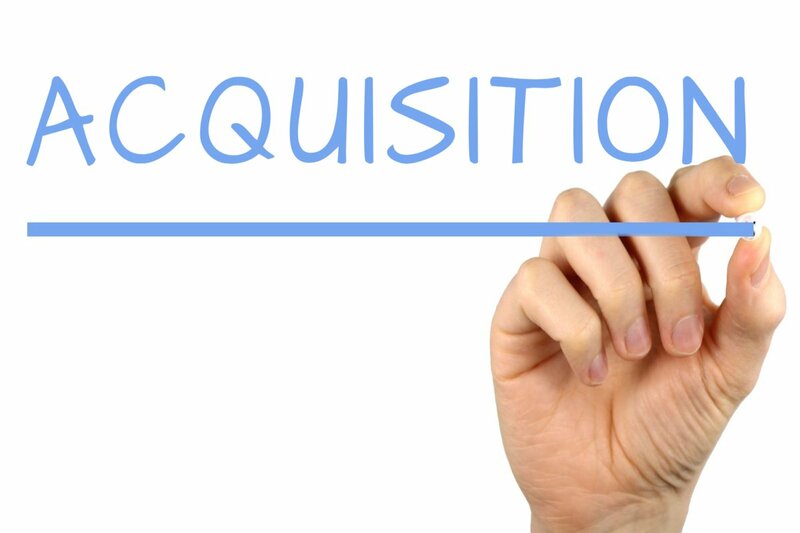 When an acquisition happens, the company acquiring the other takes complete control imposing their decisions on structures, staffing, resources, among other decisions. This in most cases ends up creating bad air and uneasiness to the acquired company and its employees. Before a company acquires another, the process must be subjected to a scrutiny to check whether it happens within the laws of the land. The two companies must also provide clarity to the necessary authorities over various laws to defend themselves against unpredictable and hostile takeovers. A merger is the process in which two or more companies come together to join forces towards a common goal. Acquisition, on the other hand, is the process by which a company takes control of another and the latter ceases to exist completely. When a merger happens, a new name is given. It could be coined by joining the companies’ names together or creating a new one. For acquisition, the acquiring company’s name continues to be used. 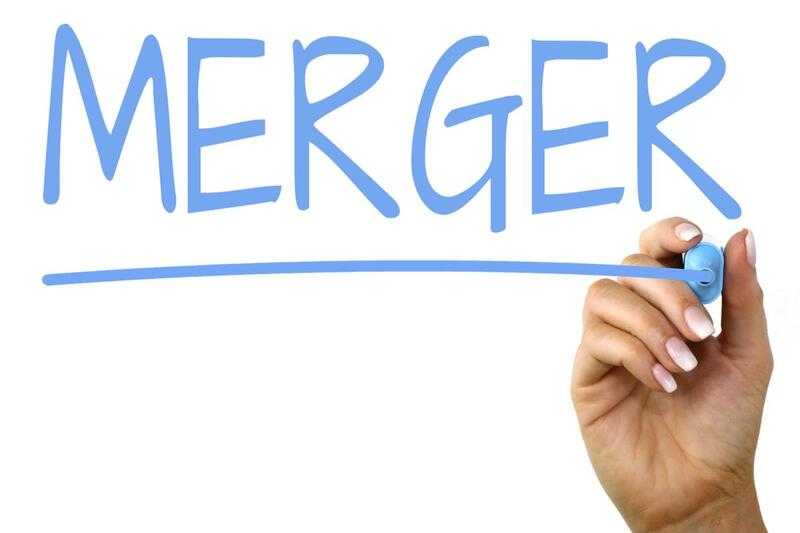 Mergers are considered friendly and out of a mutual decision by each of the merging companies while an acquisition is considered as either friendly or hostile, voluntary or involuntary. In the case of a merger, two or more companies considering each other on equal basis come together and merge for a strategic decision. When an acquisition is on the table, the acquiring company is usually larger than the acquired ones. For merging companies, their powers are almost nil while for an acquisition, the acquiring company gets the ultimate powers and to dictate terms. A merger is surrounded by more legal formalities in comparison to an acquisition. Mergers and acquisitions happen for different reasons and on varied grounds. It is clear they are two different exercises but are often mistaken to be the same. The basic thing is understanding that when a merger happens, a new company is formed with new or revised laws and names. For an acquisition, the acquiring company retains the name and decision-making rights. Sarah Brown. "Difference Between Merger and Acquisition." DifferenceBetween.net. November 12, 2018 < http://www.differencebetween.net/language/words-language/difference-between-merger-and-acquisition/ >. Singh, Jyoti. 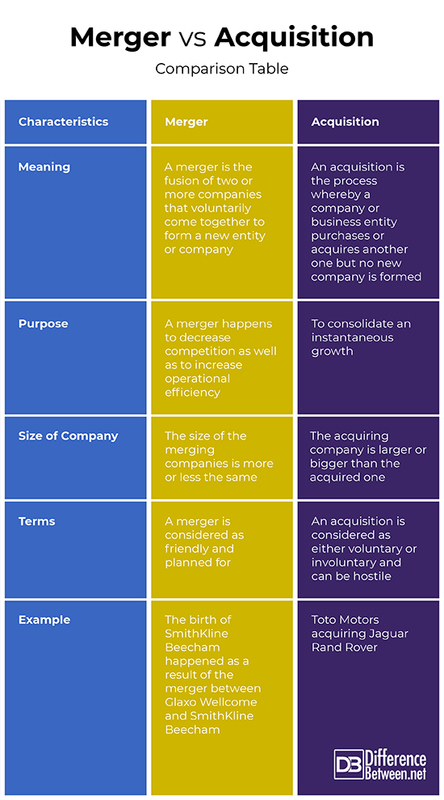 "Mergers Vs Acquisitions | Top 7 Differences (With Infographics)". Learn Investment Banking: Financial Modeling Training Courses Online, 2018, https://www.wallstreetmojo.com/mergers-vs-acquisitions/. Accessed 29 Oct 2018. "The Laws Of Mergers And Acquisitions". Lawteacher.Net, 2018, https://www.lawteacher.net/free-law-essays/business-law/the-laws-of-mergers-and-acquisitions-law-essays.php. Accessed 29 Oct 2018.